Baby Bowser has stolen the Super Happy Tree, responsible for spreading joy over Yoshi's Island. 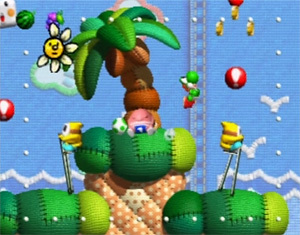 Six baby Yoshis are born and decide to head to Baby Bowser's Castle, save the Super Happy Tree and return happiness to the island. 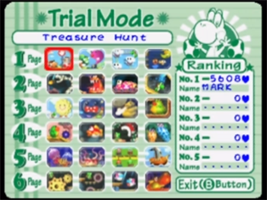 You have to travel across the six pages of Yoshi's Story, eating 30 pieces of fruit in each stage to move on to the next. Collect Hearts in each stage to unlock more stages on the next page. Yoshis can eat enemies and fruit. 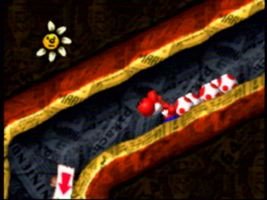 Eating enemies or fruit of the same color as the Yoshi will make them happier, filling the Flower Meter. Eaten enemies are turned into Eggs which explode, taking out enemies or bubbles. Wait on the Trial Mode stage select screen. After the music has looped a few times it will stop and a strange song will play. This is Kazumi Totaka's Song, a secret track hidden in nearly every game the Nintendo composer has worked on. For a full list, see the Kazumi Totaka's Song Guide.